Teens in grades 7 - 12 : Join us for pizza and a movie! 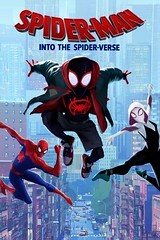 This month, check out Spiderman: Into the Spider-Verse. Then vote for next month's movie. IMDB: Teen Miles Morales becomes Spider-Man of his reality, crossing his path with five counterparts from other dimensions to stop a threat for all realities. Registration is required. If you are registering more than one person, please fill out separate registration forms.